Janitorial cleaning services are crucial for many businesses and when done right, outsourcing this task can save companies a lot of money. If you are a business owner or manager torn between hiring an internal cleaning staff or choosing an outside contractor, you need to read this article. At Desert Oasis Cleaners, we offer janitorial services in Phoenix and the surrounding area. We’ve come up with a few of the main ways in which your business will benefit from hiring a professional agency to handle your cleaning. Hiring your own staff involves training and adding another layer of employees who need to be managed. That’s not even considering the initial cost of building out a janitorial staff. Choosing an experienced and reputable janitorial service means you don’t have to take on the burden of hiring or supervising cleaning staff members. When you choose not to hire a company, you put your business at risk of creating new liability issues. The use and storage of certain cleaning materials may require specialized certifications or training. When you contract with a reputable commercial cleaner like Desert Oasis, you can rest assured the people taking care of your janitorial needs are qualified and experienced. You can create a cleaner, healthier work environment for your employees by choosing a professional service to handle your cleaning needs. 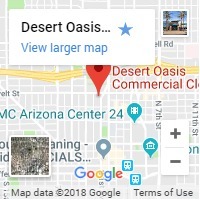 At Desert Oasis Cleaners, our crews use environmentally-friendly green cleaning supplies that work every bit as well as traditional cleaners, but without the environmental and health hazards. That means you end up with a healthier, happier and more productive workforce. Choosing a professional janitorial services provider will prove to be more convenient for your business in any number of ways, especially when it comes to scheduling. If you need a crew to come in after-hours and clean during the night, that can be accommodated. Desert Oasis Cleaners can even set up customized plans to include any number of services you may need done. From window cleaning to tile, carpet and any other cleaning task, Desert Oasis Cleaners is the number one choice for businesses in the Phoenix area. How to Clean a Tile FloorWhat Does a Professional Janitor Do?